A great lead nurturing program can have a dramatic impact on an organization’s bottom line. But so few B2B marketers actually get it right. 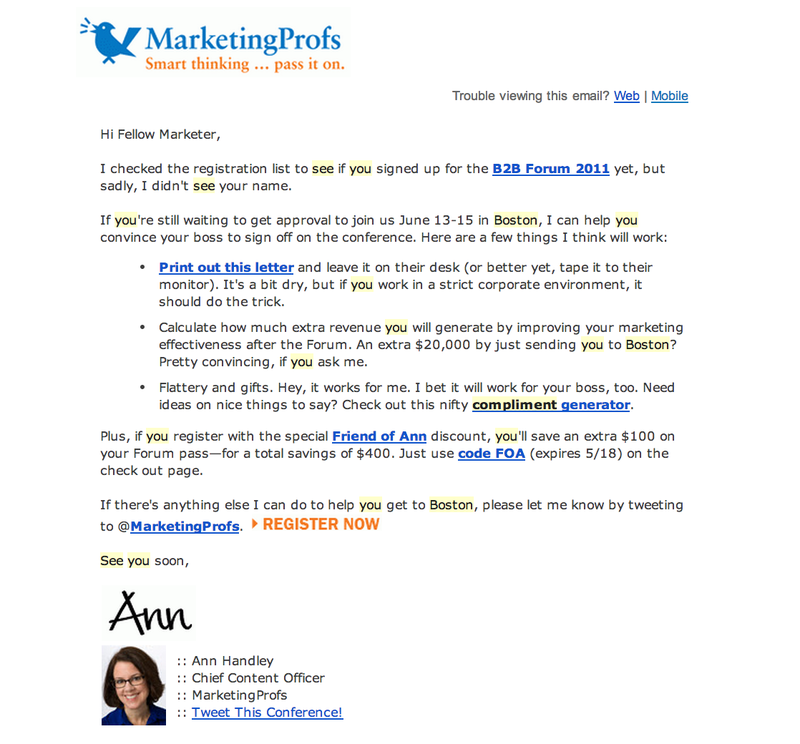 Looking back at some recent email nurturing wins we’ve had at MarketingProfs, I came up with these 5 tips for creating better lead nurturing campaigns to help you drive more sales, faster. There are reasons your qualified prospects may not purchase your product or service. Are they having trouble getting approval from a senior executive? Unsure about compatibility or technical requirements? Make sure a portion of messages in your lead management cycle address ways your prospects can overcome obstacles in the buying process. Not only will addressing those obstacles move your prospects closer down the funnel, but it will also make your sales team’s job easier. And they’ll love you for it. For example, in an email campaign for the B2B Forum 2011 (click on the example image on the right to enlarge it), we provided three tips for convincing bosses to sign off on the conference. Two of these were practical and useful: a printable letter and a brief explanation of potential ROI. The third one added some personality and humor. More on that below. We’ve all heard the saying, “People don’t buy from companies; they buy from people.” Use your lead nurturing campaigns as an opportunity for your prospects to get to know your organization and your sales team. 3. Add personality and humor. Want to stand out from the competition? Inject some humor and personality into your emails. If you’re in high-tech, B2B marketing, chances are your competitors’ emails are dry, sales-focused, and, well, lame. By adding some humor and personality to your emails, you can grab attention away from your competition. In the B2B Forum email above, we focused on helping our prospects get approval to join us at the conference, while also having a bit of fun. In bullet point three in the email, we offered a compliment generator to help our prospects flatter their bosses into sending them to the conference—you know, in case they didn’t have anything nice to say to their face. The end result? We received numerous replies from marketers who were genuinely amused by the email or “enchanted’ as Guy Kawasaki would say. Adding humor to your emails can help you stand out in a sea of boring, sales-focused drip campaigns. Of course, we can get creative at the ‘Profs because it is in line with our brand, which we describe as “fun, witty, smart, and trustworthy.” (I hope you’d agree with those adjectives!) But even in the most boring of industries, humor can go a long way. Because, hey, even IT people like to laugh. 4. Match your content to stages in the buying cycle. Okay, this tip is key, and it can really ensure that your content resonates with your leads and where they are in the buying cycle. When I set up a marketing automation solution at my last organization, I created a content map and split it into three sections—cold, warm, and hot. The cold, or new, prospects received best practices and educational content that built trust in our brand and positioned us as thought leaders. Over time, after the prospects consistently engaged with our best practices content and their lead score increased, they started to receive more product-focused information that still educated them on best practices. So, we didn’t ask for the close, but we did tell them, “Hey, we have this awesome product, too, in case you’re interested.” Once they showed a consistent interest in our product, their lead score increased again, and we moved them over to our hot leads, and they were handed off to sales, as well as nurtured with more sales-focused messages. Sounds simple, right? All good marketing should solve pain points that your customers are experiencing. But you need to make sure the content of your lead nurturing emails do that, too. It can seem all too easy to just go for the close—“Want to schedule a demo so you can buy our stuff today?” That works, if you want unsubscribes. So, make sure your emails focus on pain points your customers are experiencing. Create a list of the most common pain points (network downtime, reduced efficiency, etc.) and make sure the content in your emails solves these pain points. And if you’re in need of a grin, check out the compliment generator yourself!